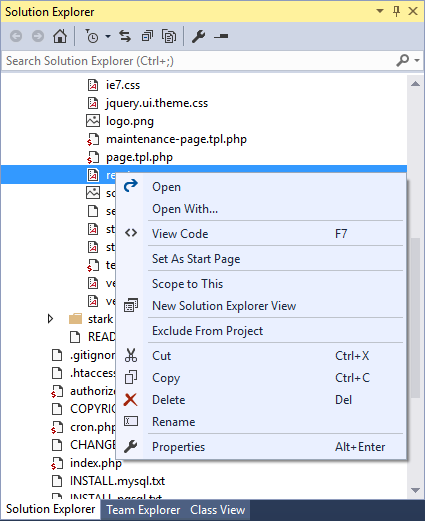 Solution Explorer window lists all the projects and contained files. The window is used to navigate to files, include/exclude files from the project, manage project references and properties. Right clicking the project node shows several additional operations including Properties. The menu command opens project properties allowing to setup a project start action and other project-specific options. The Solution Explorer lists files included in the project. In addition to that, files not included in the project but contained in the project folder can be shown using the 'Show All Files' button at the top of Solution Explorer. Use Show All Files. Click on files or folders you would like to add to the project and choose Include In Project. Drag and drop files and folders from Windows Explorer. Projects can be large, so the Solution Explorer helps filtering its content by partially typed name. The Search Solution Explorer input box is at the top of the window. The box can be focused by Ctrl+; by default. Typing text filters files immediately. The Solution Explorer allows for inspecting of PHAR archives (.phar files). Expanding the file node reveals the content of the PHAR archive including the stub file and content files. Single contained files can be opened but not edited. See PHAR Archives for more details. Every PHP project contains a References node. The node lists used composer packages in a tree hierarchy. See Composer for more information.